We've been away for the weekend and turned the computer off in our absence. Luckily maybe, because look who's been examining our email. It isn't a terribly exciting guest (perusal of the micro guide continues - see Update below), but our encounter says something about photography, computers and moths. Above is the visitor taken close-up on micro-mode without flash. Below, behold it with the flash turned on. Let the games (and Leeds Met's bats) flourish! Rather a cluttered post today. First, all hail to the Olympics which have prompted all manner of ingenuity in the retail trade. Here is a special Team GB rose which my mother-in-law Dilys got for me yesterday at the supermarket. I had to add a moth but didn't want to trap last night, to give the poor things a break after a long run. So I scoured the grass round the spot where I'd placed the light the night before. This Scalloped Oak was still drowsy enough to pose, and I guess that it could be taken to represent British pluck - Hearts of Oak and all that. Good luck guys! But where do moths fit into the plan? Eeek! They are included as food for bats. I would be a poor scientist because novelty is the main excitement that I draw from my moths. Nothing gets my heart beating faster than the sight of something different or unusual among the eggboxes. A Darwin or a Newton would buckle down instead to counting how many Yellow Underwings there are and ultimately draw important conclusions from that. Alas, not me. So here is my morsel of joy for today: although it isn't uncommon, I haven't seen a Bramble-shoot Moth in the trap before. Thanks to the Penny Wainwright Pencil Scale (using a special London Olympics pencil), you can see that it's a micro. I don't think I'm ever going to go overboard about these little creatures because they are very little; but close-up, their patterns are lovely. You can click on the pic to make it bigger. 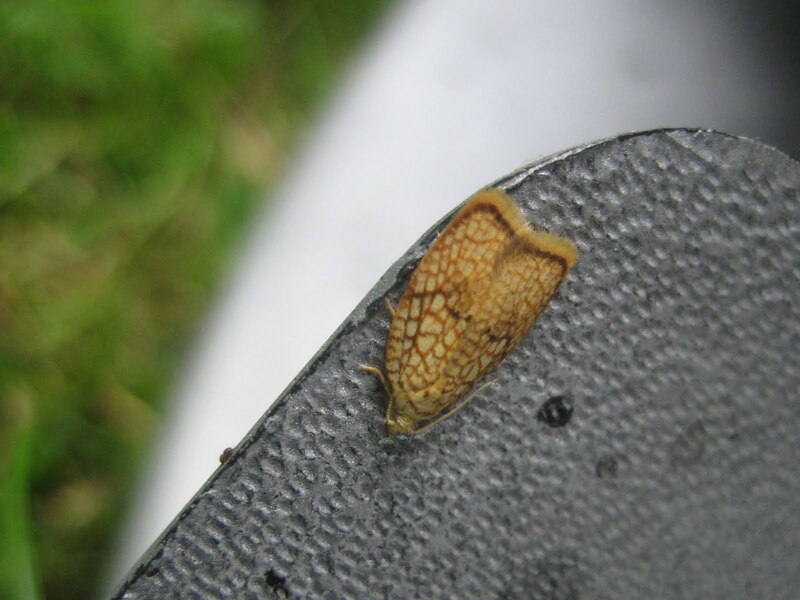 Here's another: Acleris forsskaleana with its lovely golden patterning, perching outside the trap but not inclined to flit away. its caterpillars spin little homes in rolled leaves of maple trees, of which we have a couple. We also have millions of brambles, so I take it that these two fellow-residents are happy. 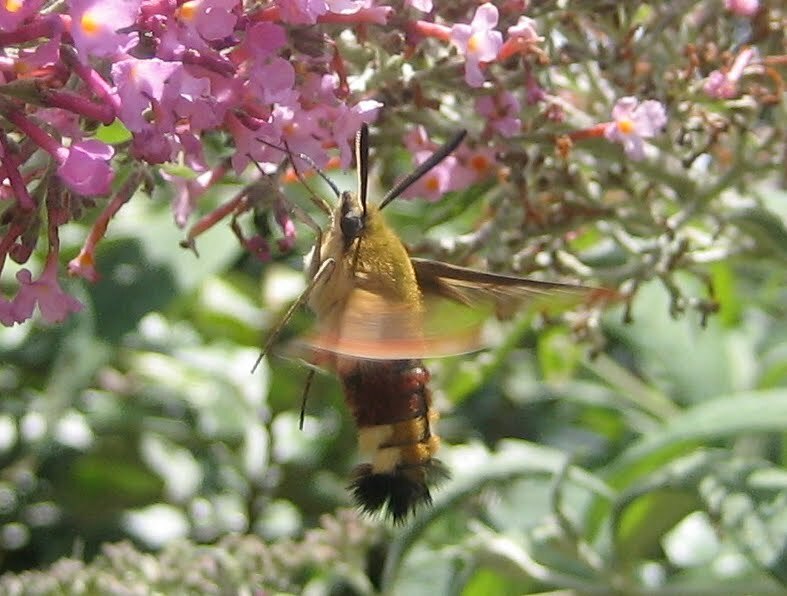 Forgive me one last visit to France but I had forgotten this lucky picture of a Bee Hawk moth outside our bedroom window in Tarn. Given the number of blurred shots I have taken of the very similar but more common Hummingbird Hawk, it is something of a miracle that everything fell into focus this time. I would quite like to have a proboscis, to whip out and then reel back in with the best of the nibbles at social functions. Moths and butterflies use them greedily and sometimes appear to enter a sort of trance when sipping nectar, especially on honey-scented trusses of buddleia flowers. Here's another avid French feeder, a Large Skipper, which allowed me close enough to portray his (or her) eager tongue. All quite human, really. The bigger the moth, the sleepier they are in the morning. Little Carpets and fragile Light Emeralds flutter away if you move the trap or its lid at all clumsily. Their fat-bodied friends slumber on. Hence the ease in persuading a handsome character such as this Peppered Moth to pose on a suitable perch. I don't normally keep our pot of black peppercorns in the trap, but the moth had no objection to staggering on to it for a brief photographic session before I tucked it safely away beneath a rhododendron bush. 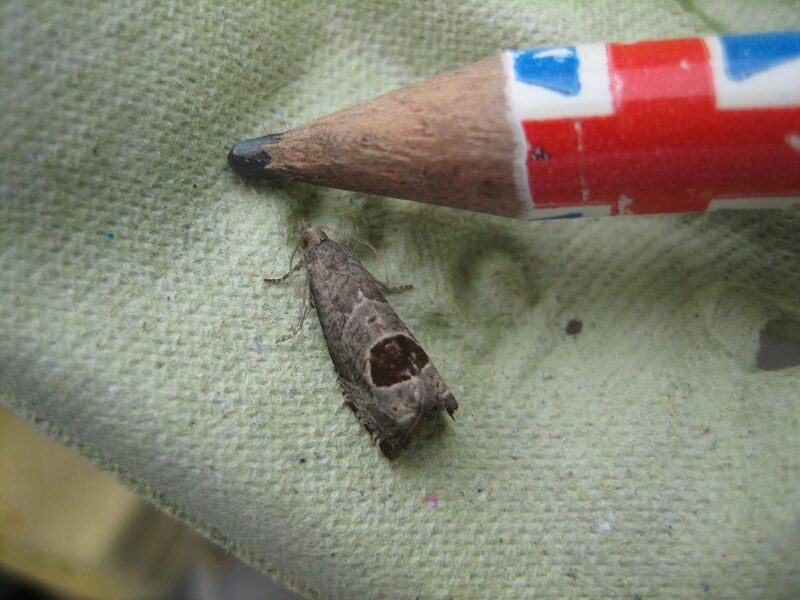 The Peppered is one of our most famous UK moths because of its role in Darwinian theory. The rise and fall of the melanistic version has had a marked correlation with the level of pollution which made melanistic moths safer, in terms of camouflage, when our world was sootier. The doctor and entomologist Sir Cyril Clarke plotted a similar graph linking the increase in human longevity (he counted the number of centenarians' telegrams from Buckingham Palace) with the rise of the standard Peppered Moth like the one in the picture. Its camouflage, breaking up its shape in the manner of dazzle warships, is more suited to our cleaner world. I haven't had a melanistic Peppered here for three years. Here's another peppery-coloured moth, a micro which seems to have crash-landed on its eggbox last night, and which I'll try to identify at leisure. It scooted off safely just after this picture was taken. Update: my best guess at the moment is Eudonia mercurella. Bonjour M et Mme les Limaces! Or Welcome Slugs, not a phrase often heard; and indeed in my Googling just now for the French for 'slug' I found warlike websites with such titles as Lutte contre les limaces advocating strategies ranging from growing 'slug-hostile' plants such as tagetes and begonia to strewing your flowerbeds with pine needles and hot chocolate grounds. However, slugs are welcome here because I promised my daughter-in-law Abi who shudders at pictures of moths, that today's post would be moth-free. And who could resist a limace like this one with its orange petticoat, encountered crossing the lane outside the cottage where we stayed at the beginning of the month in Tarn? Here to accompany it, is a limace Anglaise, gliding above our kitchen door, a height of some eight feet off the ground, and nicely showing its internal organs thanks to the outside light. Yum. Or Yuk. I don't think Abi will be upset by butterflies, meanwhile, and here's a final selection from France, showing how many we in the UK share in common with sunlit spots such as Tarn. Above, a Small Copper. Below, Large Skipper, Peacock, Comma, one of the Graylings(? ), Wall - under and overwing - and Hedge Brown. Back in olde England meanwhile - would you believe it? - after yesterday's sun, we've just had another brief shower. 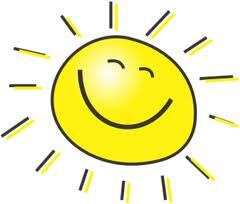 But at least it's warm and officially the weather prospects are rosy. At last! It's a dazzling morning and I'm also glowing with virtue after reading the Gipton Methodist newsletter which I much enjoy. It's a mixture of jokes and good sense; for example, the story of a mother who stops her sons arguing over a toy by saying that Jesus always thought of other people first. "Let's play that," says the sharper of the pair. "Johnny, you can be Jesus." Someone dreads the days of drought for drought means death and dearth. Though whether that will console the organisers of the Great Yorkshire Show, whose cancellation amid a mudbath has cost them over £2 million, is another matter. 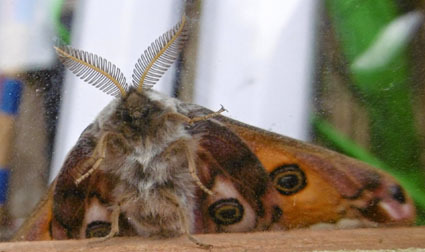 Now here are excitingly long, thin pictures called How Moths in Leeds Cope with the Rain. First of all, a Common Footman makes use of it, sipping alone amid the raindrops on the trap cover. Next a Garden Rose Tortrix micro (I believe) tucks itself into the smallest, dryest space it can find. Then the micro Anania coronata wisely shields itself by clinging to the right (underneath) side of the trap top. While a Plain Golden Y (I hope) finds an even higher perch. 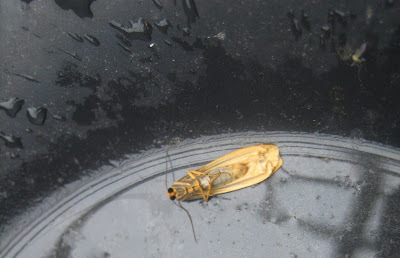 And finally, another Common Footman goes floating in the puddle at the middle of the trap bowl. It didn't drown. The picture on the left shows it heading for the towel room after I made it a small raft from an eggbox and helped it on to dry land. Sorry it's blurred, but the moth was on the move. Now I must go out into the sunshine and see belatedly what last night has brought to the trap. Nicely matching it, is this Scalloped Oak which crept into its eggbox cone to avoid early morning drizzle. And look at the luscious creature, below: a Purple Thorn, I think, although it could be an Early one; both have second generations on the wing at this time of year in spite of the latter's name. There was plenty more in the trap last night so stand by for further instalments. But I've had to spend a bit of extra time rescuing some of the moths from a minipond in the trap bowl on little lifeboats made from scraps of eggbox, so I'll stop here for now. No drownings, I'm glad to say. Update: and now that moth. Guess what, it's a Sallow Oak too, the same as the one creeping into the eggbox cone but clearly a lot less shy. Thanks very much to David - see Comments - for cracking yet another Wainwright-baffling conundrum. If you look closely, you can see the shadowy band and vague markings which are so clear in the second picture. But what clobbered it? Two days ago I was speculating on how many Poplar Hawks we have here - the largest by a stretch of all the moths which come to the trap. Today we have part of the answer: at least two. This raises the question of whether the moths can tune into the internet with those remarkable antennae, and have found Martin's Moths. What a thought. One of them at least was most obliging. It staggered across its eggbox (damp from the inevitable overnight rain) and in the process showed off the maroon blotches which relieve the species otherwise military grey. They laid on a dress rehearsal at the end of last week when I saw this group of them before I even got to the trap: Common Waves or Light Emeralds like the example below which was in the eggboxes when I lifted the lid and began my checks. With them come equally delicate species such as the Willow Beauty shown below. I am very pleased to record these moths in good condition; as fragile and relatively large-winged moths, they soon start showing smudged scales or frayed and torn edges to their wings. *Footnote: I married one of the said girls who was also chief sub of Cosmo at the time and she has just helped me to rephrase my metaphor on the grounds that I might be thought to have been reminiscing about girls rather than moths drifting about under streetlamps; as in the risky coincidence for entomologists that the Malay kupu-kupu malaam means both 'moths' and 'prostitutes'. 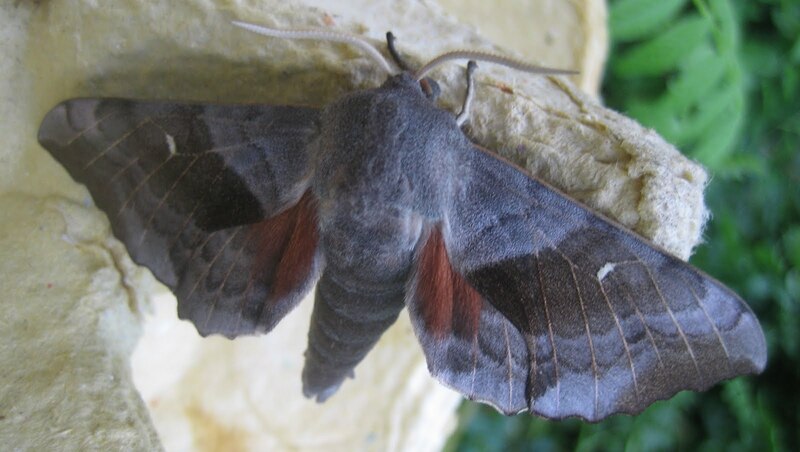 Our biggest moth here in Leeds, the Poplar Hawk, is still around, I'm glad to say, and in good condition considering the various types of downpour we've been enjoying. I don't know how many there are; maybe I should tag them in some minute and uninvasive fashion; but I always take great pains to hide them in the morning from the birds, for whom they would be a Michelin-starred feast. This one's refuge deep in the eggboxes suggests that they are good at hiding themselves, doubtless through long years of Darwinian natural selection. Back in my French Collection of butterflies, meanwhile, here are two more sunny memories of our week in Tarn: a Small White, common as much but very interesting to watch. Both here and in France, they are extremely skittish and come to rest much more seldom than most other species. The other 'white' which frequented the garden was this Pale Clouded Yellow. Its cousin the Clouded Yellow occasionally skimmed through but always too quickly for me to galumph after it with the camera. Both butterflies have been involved in sensational mass immigrations to the UK from France in past years, with eye-witness accounts of fields in Dorset and Hampshire turning creamy-coloured when they finally sank to rest after their long flight. People often criticise moths for being dull and grey, but there can be beauty in such things. So too in that simplest of combinations, black and white. Here are a couple of examples, first a moth and then a species of butterfly, the latter from my stockpile of sunny pictures from our week in Tarn, south west France, a fortnight ago. The moth is the Clouded Border, a small and slightly smudgy character which can sometimes be disturbed by walkers brushing past the many trees which it frequents: aspen, sallow, poplar, willow and hazel. 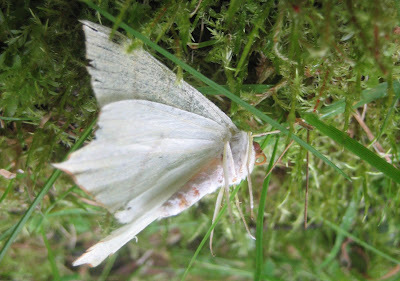 It is common and a reliable visitor to the light trap here in June and July; and always welcome, for its delicate appearance before it flutters off - unlike the larger-bodies moths, it seldom falls into a deep overnight sleep. The butterfly is the Marbled White, or rather two of them busy creating a whole lot more. These lovely creatures, which long anticipated the Op-art movement of the 1960s (I still have my tie), are quite widespread in the UK, especially on chalk downland. I have been entranced by them flying with various types of blue at Wharram Percy, the deserted mediaeval village near Malton in North Yorkshire. A wonderful combination. Here to end with are a couple more French Marbled Whites, showing the chessboard top and then the underwing whose patterning is beautifully subtle. When Charles Darwin was a boy, he decided only to study those insects which he found dead, rather than sallying forth with a net. He soon abandoned this gentle-hearted policy because he had so little research material. The natural world abounds with such skilled predators and scavengers that we humans seldom come across carrion of any kind. I did yesterday, though, and it was rather a spectacular example. We were just about to head off for a lovely walk round Askwith as part of Penny's birthday celebrations, when we spotted this - on the road right outside our house. Most unluckily, it must have been hit by a car and presumably while day-flying, as we set off at around 11.45am. It is an Old Lady moth, a species which has never come to the light in all my five years of trapping. I did find one once, with my cousin Tim Warin, when we were butterfly-hunting boys staying at the vicarage of our Uncle Tim in Suffolk. He and his wife Marion also had two elderly parishioners staying from their previous parish in Crawley, nick-named (to their faces) 'Baldy' and 'Nye', and there was some initial alarm when we burst in at dusk from our rum-and-treacle traps, shouting: "We've got an Old Lady!" The reason for the excitement is less the colour and patterning, which accounts for the name in an era when old ladies did not wear purple, than the moth's impressive size. 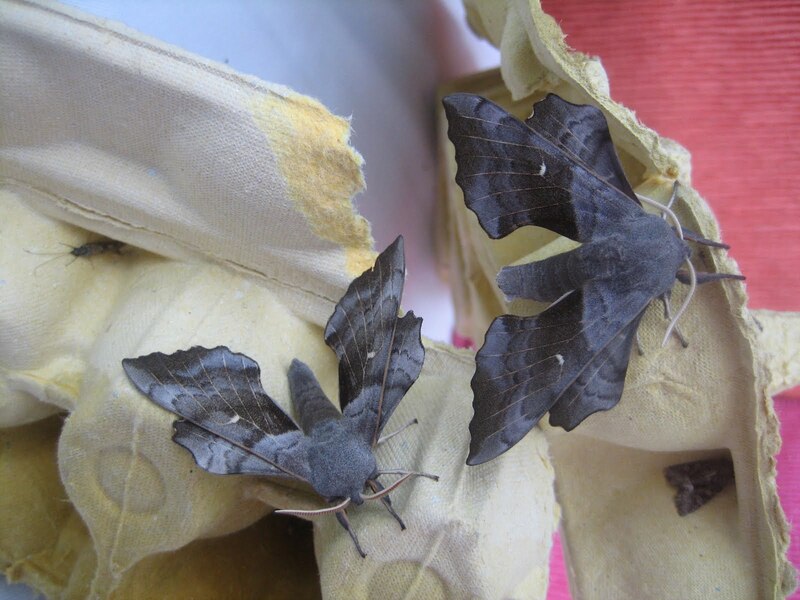 Apart from the hawkmoths, it is one of the UK's biggest. If you were wondering, the lustrous backdrop is our car's bonnet. Here's another picture. RIP.